Precipitate Adds New Drill Target a | Precipitate Gold Corp.
Vancouver, B.C. 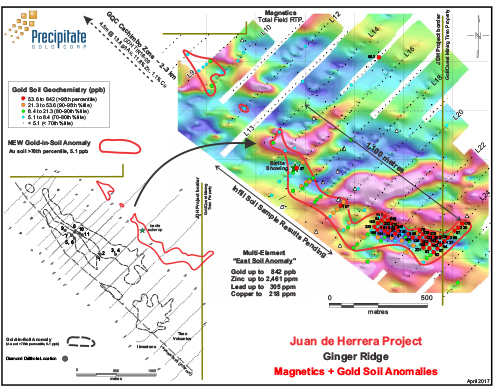 – April 11, 2017 - Precipitate Gold Corp. (the “Company” or “Precipitate”) (TSXV: PRG) is pleased to announce follow up results for the recently identified gold-in-soil geochemical anomaly at the Ginger Ridge zone, within the Company’s 100% owned Juan de Herrera Project in the Dominican Republic. Results of ongoing follow-up work on the Company’s new high priority multi-element soil anomaly indicate a measured surface length of 1,100 metres (“m”) and an estimated average width of 100 metres. The northwest-southeast trending zone is both consistent and strong, with notably elevated gold, lead and zinc values on the southern part of the anomaly. This new area is located approximately one kilometre east of the main drill test area at Ginger Ridge and is rapidly developing into a high priority target. See the accompanying map or the Company’s website for the Ginger Ridge gold-in-soil anomaly illustration map. The zone envelopes a large barite subcrop exposure hosted in Tireo volcanics. Barite is commonly associated with many notable Tireo Gold Camp mineral systems, particularly with volcanogenic massive sulphide (“VMS”) systems. Jeffrey Wilson, Precipitate’s President & CEO stated, “We are delighted that follow up work on our new multi-element soil anomaly demonstrates both strong and consistent gold, lead and zinc values over a large area of target Tireo Volcanics. The fact that the zone is coincident with a strong magnetic low geophysical signature is an additional and important characteristic. Magnetic lows are a common indicator of underlying hydrothermal activity that led to magnetite destruction. This appears to be the most significant surface anomaly identified to date by our crews. The area is currently undergoing addition detailed infill soil sampling, hand trenching and geological mapping, in order to complete target delineation in advance of drilling at this new high priority zone." Recent soil samples were collected on 25m by 25m grid intervals along northeast oriented grid lines. The multi-element soil anomaly is characterized by a correlation of gold with various pathfinder elements which include arsenic, antimony, silver, lead, and zinc. The gold-in-soil anomaly is defined by values exceeding the 70th percentile (5.1 ppb). To date, gold-in-soil values within the new anomaly area range from nil to 842 ppb. Early geological mapping at the anomalous zone indicates the zone is underlain by intermediate volcanic rocks with a northwest strike and an estimated dip of -45 degrees northeast. The new soil anomaly is on general trend with the recent “Cachimbo” discovery by neighbouring GoldQuest. The Ginger Ridge zone is part of a larger series of hydrothermal centers that stretch some seven kilometres through to Precipitate’s “Southeast” and “Jengibre South” targets, among others along trend.. Precipitate crews are working on targets in the southern portion of PRG’s Juan de Herrera project and work from these areas will be reported separately as results are received and interpreted. Rock and soil samples were bagged, sealed and delivered directly to Bureau Veritas (“BV”) preparation facility in Maimon Dominican Republic where they were dried, crushed (or sieved in the case of soils) and pulped. Sample pulps were then delivered to BV facilities in Vancouver BC (an ISO 9001 accredited facility) for analyses. Samples were crushed (or sieved) to with up to 80% passing 2mm and split using a riffle splitter (code PRP70-250). An approximate 250 gram sub-sample split was pulverized to minus 200 mesh (74μ). A 15 gram sub-split from the resulting pulp was then subjected to aqua regia digestion and multi-element ICP-MS analysis (code AQ201). Rock sample results with gold greater than 1,000 ppb were subjected to fire assay (ICP-ES finish) analysis (30 g pulp; code FA330-Au).